Up for sale is a SET OF (4) USED TPMS (Tire Pressure Monitoring Sensors). These are the exact same sensors you would buy at your local dealer...just at a much cheaper price!! Electronically tested for signal and guaranteed to be fully functional. All batteries will pass on the scan tool or they will not be shipped. 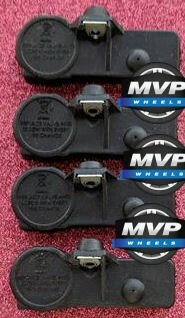 Sensors come with all parts shown in the pictures, THEY DO NOT INCLUDE A VALVE STEM OR MOUNTING NUT. Almost all sensors will need to by synced to your vehicle with a scan tool. Select makes and models can be programmed by instructions provided in the vehicles owners manual. Please verify application prior to bidding. We are NOT responsible for fitment. Parts compatibility is for suggested applications only.